Correct response: What is a filibuster? Are you a Hamilton fan? You can blame Aaron Burr for the Senate filibuster. When he was presiding officer of the Senate in 1806, he oversaw the removal of a rule allowing Senators to end debate and proceeding to a vote by simple majority. However, because it was not replaced with any other rule limiting debate, filibusters became theoretically possible, indefinitely preventing votes. However, during World War I, after a group of 12 anti-war Senators blocked legislation that would have allowed President Wilson to arm merchant vessels, the concept of “cloture” (a procedure to end debate) was instituted. At the time, two-thirds of voting Senators were required to enact cloture. Eventually, that requirement was dropped to 60 (and controversially currently sits at a simple majority for all Presidential nominees.) The House of Representatives does not permit filibusters. An average of 3.9605 5+-time champions (standard deviation 1.656). An average of 7.1254 4+-time champions (standard deviation 2.036). An early cutoff took place 6.709% of the time (or a 5-game winner will be left out). Will Dawson qualified 29.397% of the time. Anneke Garcia qualified 79.017% of the time. Dave Leffler qualified 58.805% of the time. Jonathan Dinerstein qualified 32.342% of the time. Alex Schmidt qualified 11.177% of the time. John Presloid qualified 2.837% of the time. Jackie Fuchs qualified 0.342% of the time. In a couple of cases, Will seems to be putting the emphasis on the wrong syllable (Gloria Estefan for one). No, this does not make the response incorrect. In general, as long as the response can still be reasonably be spelled the same way as the pronunciation, the judges will accept the response. 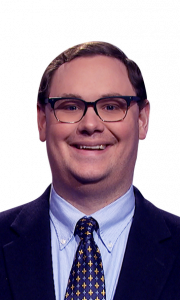 Another thing that I’ve noticed: A viewer that generally dislikes a contestant, for whatever reason, is more apt to lose the ability to judge a player objectively, thus leading to increased claims of rules violations. Morgan seemed very quick to respond tonight when Alex called on him, to the effect that it seemed like his phrasing was crossing over Alex calling on him. Yes, it was there. Part of me thinks it might have been sound editing, so as to fit all of the clues into the show (after all, both rounds barely survived a less-than-a-minute-to-go call). 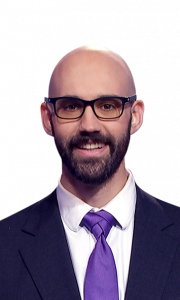 On that note: when did Jeopardy! become the PGA Tour of yesteryear, where so many viewers are armchair judges, and expecting some sort of satisfaction when trying to bring these violations to the attention of the show? Will was in a tight spot on that last Daily Double; over the past season and a half, $2000-level Daily Doubles have played at only 54%. 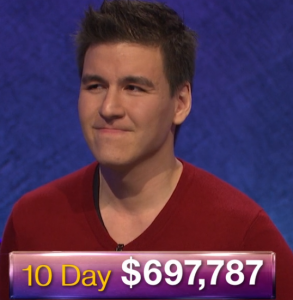 (An average Daily Double in Double Jeopardy has played at 65% over the same time frame.). If it were an $800 Daily Double, it’s a situation where you try to put the game away then and there, but it isn’t. I don’t think I’d have gone any higher than $3,600 if I was in that spot. 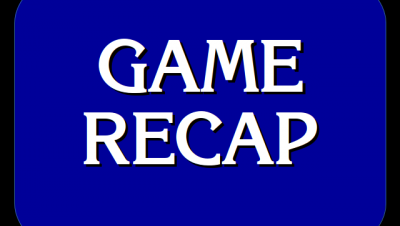 Of course, it ended up being that a bet of $2,601 or higher would have made Final Jeopardy! immaterial, but the results of Final turned that into a moot point anyway. 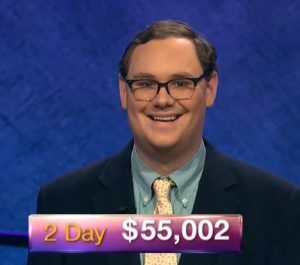 11 Comments on "Today’s Final Jeopardy – February 4, 2019"
They will probably all get it, but based on his occupation, I really like Will’s chances on this one. For the record: I have zero issue with viewers getting upset at Alex’s pronunciations; that has no effect on the actual outcome of games. Andy, I agree that’s generally true, but does the show still allow visually impaired contestants who would be relying on Alex’s correct reading of each clue? I can safely say that to me, this was the easiest FJ question I have ever seen. Whether he did or not, by rule, any misspelling that could be pronounced the same way as the correct response is still acceptable in the eyes of the judges. Yes, he did spell it wrong. I particularly noticed it. Kind of a superficial comment, but this seemed like the sharpest dressed trio I can remember. Usually one or more dress a little more casually, which means nothing at all, but it just kind of jumped out at me today. Morgan sent me to the internet to see how to tie a necktie like he did. I’ve always just done the basic windsor knot, but he’s given me something to think about. 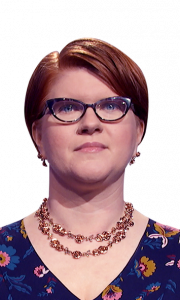 I am pretty sure that Susan wagered $2000 on a daily double, got it wrong, and her score dropped from 8400 to 5400. This was never corrected. Did anyone else notice this? It was a very clear $3,000. You misheard. Also note the recap above.